Ideal for kitchens with a high amount of traffic, but limited space, this Mini Centrefeed Dispenser provides a perfect solution. The slim design will still hold 120m long centrefeed rolls for less frequent replacement. The dispenser completely encloses the roll to prevent contamination and maintain optimum levels of hygiene in busy kitchens. 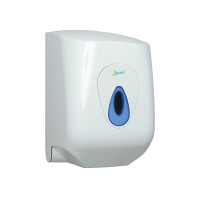 Ideal for use with 2Work Mini Centrefeed Rolls, this wall mounted dispenser is also lockable to prevent tampering.